Micky Dolenz remains a totally underrated vocalist in the Rock world, and his performances on this album are superb. This guy has more soul now than ever, and you can tell he’s having a good…no, make that GREAT time on these songs. Peter Tork has never sounded better than he does on his two featured lead vocals on the album. Michael Nesmith takes the lead on three tracks and brings his sincerity, easy-going charm and confidence with him. Even the late Davy Jones gets a turn at the mic thanks to modern technology (but more about that later). Nesmith and Tork brought their own game to the original Monkees albums, often adding Folk and Country elements to the band’s formula that may not have been part of Don Kirschner’s original bubblegum blueprint. On Good Times, that tradition continues with both members making sizeable contributions to the overall sound and feel of the album. Micky and Davy may have been the lead voices on most of the hits, but Nez and Tork were just as important to the band’s recorded output. When putting Good Times together, producer Adam Schlesinger (Fountains Of Wayne) wisely let them continue adding their own musical stamp to the sessions, which proves just how much he fully understands the chemistry that made The Monkees work. Instead of choosing between a retro or modern sound, Schlesinger and The Monkees team chose both paths – literally and figuratively. Most of the album was recorded in 2016, but there are a handful of tracks that mix original backing tracks from the band’s heyday with new twists and tweaks. However, these original backing tracks are from songs that were never officially released back then. You’re certainly not getting “I’m A Believer, 2016” or some nonsense like that. What you do get is a spirited duet between Micky and Harry Nilsson on the album’s title track, plus an updated version of the Neil Diamond-penned “Love To Love” featuring Davy on vocals. (My ears may be deceiving me, but this sounds like an alternate vocal take to the versions that were finally released in the ‘80s and ‘90s). “Love To Love” has always been one of my faves, so hearing it with Dolenz and Tork providing new backing vocals is a real treat. Schlesinger and Co. seamlessly blend new with old, making Good Times a consistently engaging listen from beginning to end. Along with classic songs by Nilsson, Diamond, Tommy Boyce & Bobby Hart, and Carole King & Gerry Goffin – plus excellent Tork and Nesmith originals – Good Times includes new songs written for this project by XTC’s Andy Partridge (“You Bring The Summer”), Weezer’s Rivers Cuomo (“She Makes Me Laugh”), Adam Schlesinger (“Our Own World”) and Death Cab For Cutie’s Ben Gibbard (“Me & Magdalena”). “Birth Of An Accidental Hipster” – penned by Noel Gallagher and Paul Weller – could easily have been on The Monkees’ 1968 album The Birds, The Bees & The Monkees. Dolenz and Schlesinger offer up the album closer “I Was There (And I’m Told I Had A Good Time)”, which finds Micky in fine rockin’ voice. The performance is reminiscent of his playful vocal on “Saving My Love For You” from the Dolenz Jones Boyce & Hart album released in 1976. Unsurprisingly, half of that team - Dolenz and Bobby Hart - appear on Good Times! I might have to wait another twenty years for another new Monkees album. Good Times is the band’s best full studio offering since 1967’s Pisces Aquarius Capricorn & Jones album and definitely one of the best albums of 2016. 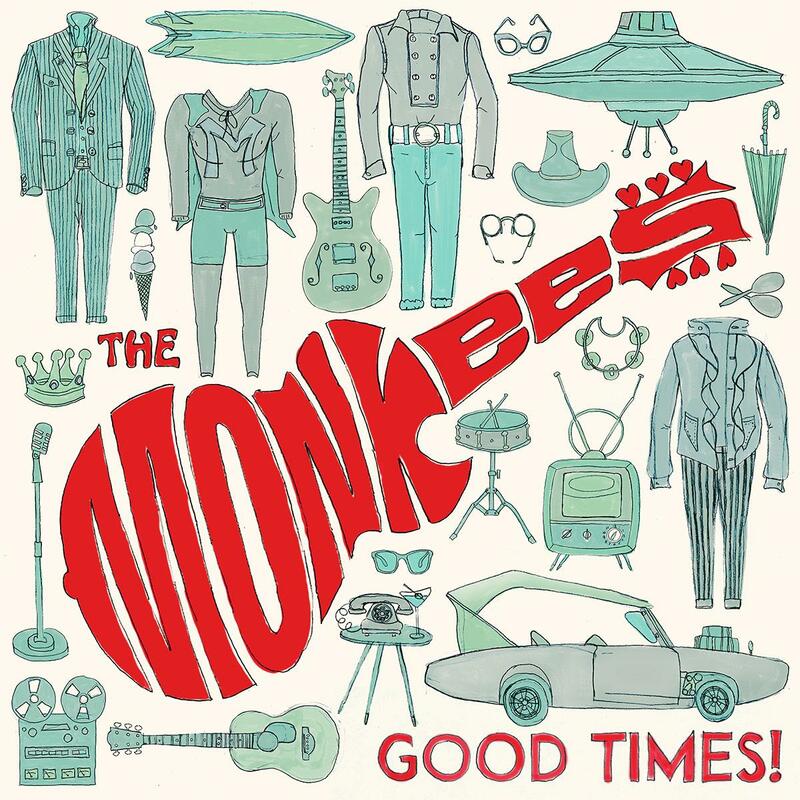 It is filled with songs that are short, sweet and filled with the Monkees magic that has really set them apart from their contemporaries in the ‘60s and even today. Does it sound like a classic ‘60s Monkees album? No, but it does feature all the elements that made those albums stand out: great songwriting, production, performances and vocals. Good Times is modern and filled with more energy and excitement than a Chuck E. Cheese during a six year old’s birthday party! From joyful (“You Bring The Summer”, “She Makes Me Laugh”) to melancholic and lovely (“Me & Magdalena”, “I Know What I Know”), this is a feast for those who like hook-filled slices of Pop that rarely exceed the three minute mark. It is more than a great Monkees album – it is a great album PERIOD. If you dig the swinging’ ‘60s, Power Pop, Jangle Pop and a dash of Soul and Psych-Rock, then this is an album you should take home and snuggle with. It spans and criss-crosses generations, mixes them together and lathers it all with love. Good Times, indeed! Fifty years on, I still heart The Monkees.